Thank you for purchasing the Hotchkiss Otoscope and welcome to a proud tradition of innovative instrumentation in Otoscopy! The Hotchkiss is an operating Otoscope that allows the user unsurpassed ease in instrumentation and represents a radical departure in otoscope design. To derive maximum effectiveness from it, the user must become familiar with certain techniques. 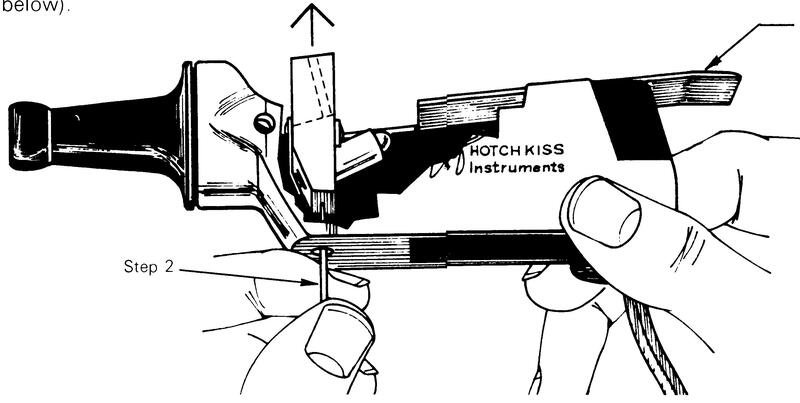 The following instructions will acquaint you with the operational features of the Hotchkiss Otoscope and instruct you in its proper use. All Hotchkiss power sources are completely interchangeable. The optical head is universal so the user may choose the power source that best meets their needs, or add another type at anytime. 1. To connect the around-the-neck power source to the optical head, slide the narrow end of the swivel base into the tracks of the optical head. 2. Push firmly until the swivel base clicks into place. 1. To connect the clip-on power source to the optical head, slide it into the tracks of the optical head. 2. Push firmly until unit clicks into place. 1. Plug transformer into 110v. wall outlet (220v. model is also available). 2. Plug two-pronged adapter cord into the transformer. 3. Slide the narrow end of swivel base onto the tracks of the optical head. 4. Push firmly until the swivel base clicks into place. The Hotchkiss Otoscope uses two "AA" size alkaline or rechargeable nickel cadmium batteries. 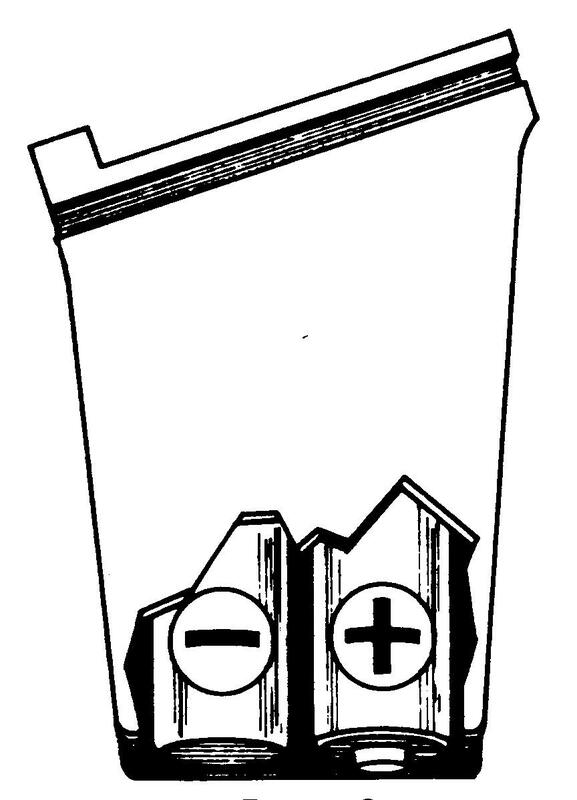 Important: Proper battery alignment is clearly indicated in each power source by the plus (+) and minus (-) sign, found on the inside contact plate of the trap door in the clip-on (see Figure 3) and the battery end-caps in the around-the-neck (see figure 4). The Clip-On power source or the Around-the-Neck power source may be recharged on the Hotchkiss Recharging Unit. Replace the alkaline batteries with nickel cadmium cells (supplied with the Recharging Unit). Plug the Recharging Unit into a 110v. wall outlet. (220v model is also available). To recharge, disconnect the power source from the optical head. Turning the power source contact side down, slide it onto the recharger in the same direction as you would place it onto the optical head. When properly in place the indicator light will go on. If the batteries are misaligned the indicator light will not go on. (See figures 3 and 4 above). Pull back the cover slide on top of the optical head (step 1 in Figure 5). With the pneumoscopy bellows tip or similar pointed object (screw driver, ball point pen or Q-tip) push up through the carrier hole in the bottom of the optical head to lift up the lens-bulb carrier (step 2 in Figure 5). Screw new lamp in place snugly (clockwise), do not overtighten. Optical adjustments can be made by backing the Xenon Lamp/Reflector out of the lens-bulb carrier. First observe the optics with the lamp firmly in place, if adjustment seems necessary back the lamp out of the lens-bulb carrier a quarter to a half turn. When returning the lens-bulb carrier to the optical head, have the otoscope turned on. 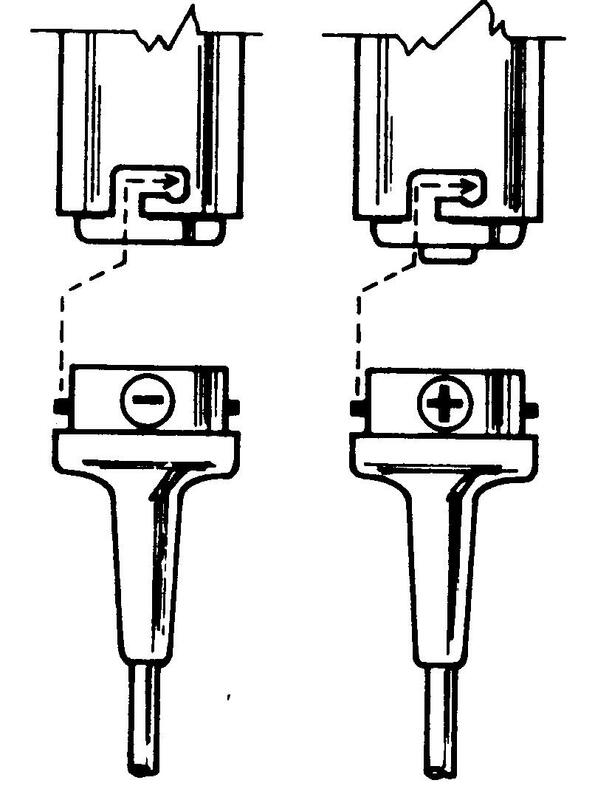 The Reflector on the lamp should not touch the battery contact in the front; nor should the Xenon lamp stem touch the body of the optical head in the back. If either touch, the Xenon Lamp/Reflector will not light when in place. To correct simply readjust by screwing the lamp in or out. Keep the optically coated lens clean at all times to avoid blurring of the image and to reduce internal reflections. Remove lens-bulb carrier as in figure 5 above. Clean the lens regularly with a Q-tip or lens cleaning tissue moistened with lens cleaning solution or alcohol. Note: Do not clean with acetone or other similar solvents. For coaxial illumination, always look through the round viewing port. Never view through the instrumentation opening. This results in parallax error and lack of magnification. For best visualization, keep eye at least one to two inches from the viewing port. To hold the Otoscope, place the thumb and index finger in the recessed areas near the specula-holding hub. This leaves the middle finger of the same hand free to straighten the ear canal. Be sure to use this two-finger grasp even when the clip-on power source is used. 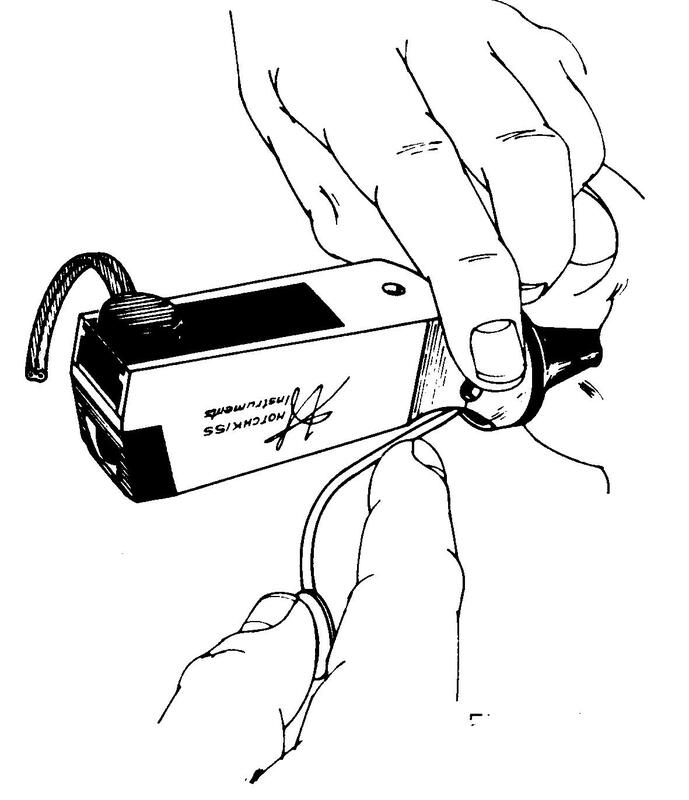 Simply let the clip-on power source rest on the proximal phalnax of the index finger to obtain the proper balance. Rest the fourth an fifth fingers against the patient's head. Thus if the patient moves, the otoscope and hand moves with the patient. 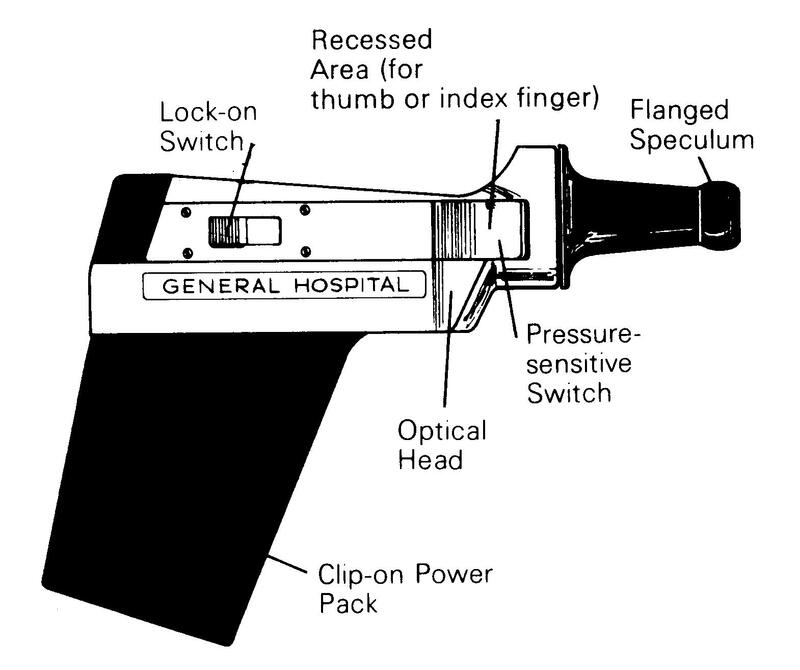 To activate the switch built into the side of the instrument, simply exert a slight amount of pressure with the finger and thumb holding the Otoscope. On relaxing this pressure, the switch will automatically return to "off" (prolonging life of battery and lamp). For operational procedures, instrumentation, cerumen management, foreign body extraction use the lock-on switch. The Hotchkiss Otoscope is designed to give 360 degree, or complete, instrumentation access to any visualized area. When the straight edge of the lens becomes a limiting factor, rotate the instrument, moving it from a horizontal position where the index finger is pointed horizontally (figure 8) to a vertical position with the index finger perpendicular (figure 9). Place the switch in the lock-on position. Place pneumoscopy bellows air tip into the pneumoscopy port on non-switch side of optical head. 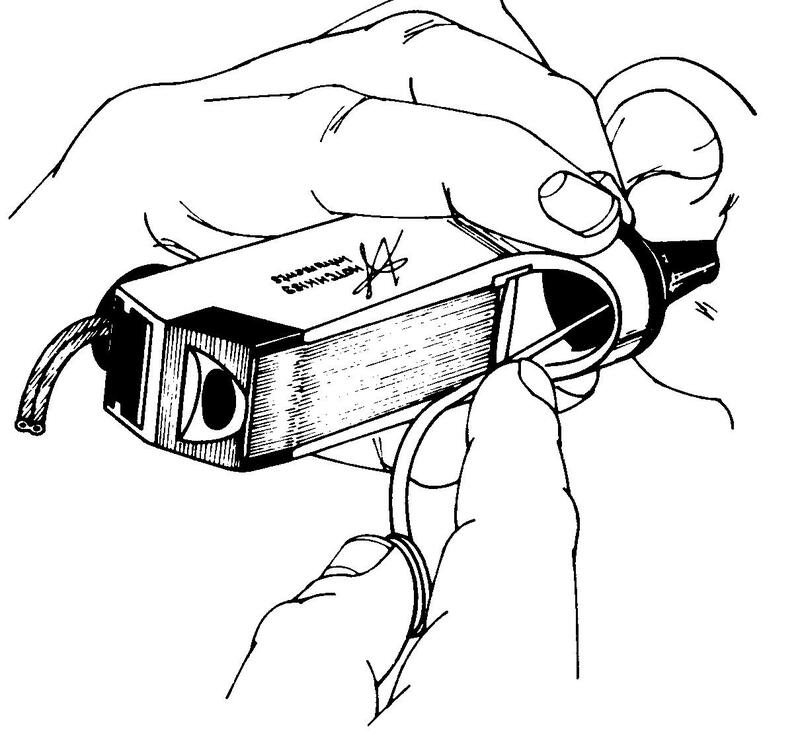 Hold the Otoscope with the left hand (see figure 10 below). Be sure to cover the instrumentation opening by placing the thumb across the opening. This forms the airtight forward chamber. With your right hand pump bellows. For most effective evaluation of TM movement, use short, rapid pumps. Always be sure to use a specula tip large enough to produce the proper air seal between specula flange and canal wall. Insert either the 5x Magnification Unit and/or Corrective Lens into the viewing port and push until the unit is firmly seated. The 5x Magnification Unit should be rotated in the viewing port until it locks into place. To focus the 5x Magnification Unit, turn the knurled outer focusing ring at the back end of the unit. a) Unscrew the Corrective Lens from it's retaining tube. b) Then screw the Corrective Lens into the threads cut into the back end of the knurled focusing ring on the 5x Magnification Unit. c) Save the Corrective Lens retainer tube for future use. When using the optical accessories it is essential that the lens of the otoscope be as clean as possible. Fingerprints or dust on the lens will be magnified by the unit. See Cleaning the Lens above. The autoclavable or reusable specula are black and come in 6 sizes, ranging from 2.5mm to 8mm. They are designed for instrumentation and pneumatic procedures. They may be sterilized by autoclaving or soaking. Cleaning: Autoclavable Specula may be cleaned in a warm water-mild detergent solution. -Soaking in a 14 day glutaraldehyde solution following manufacturer's instruction for exposure time and temperature for intermediate disinfecting. -May be sterilized using any "standard" autoclave cycle when temperature does not exceed 280°F (138°C). Do not flash autoclave. -May be gas sterilized using ETO concentrate of 10-100%. Do not exceed 4 hour exposure time or 132°F (55°C). Aerate 12 - 16 hours at 120°F (49°C). -Soak in a 14 day glutaraldehyde solution following manufacturer's instruction for exposure and time and temperature. The disposable specula are also black, however each one is clearly marked with the word "disposable". The disposable specula come in 2 sizes - pediatric and adult (also clearly marked on each specula). 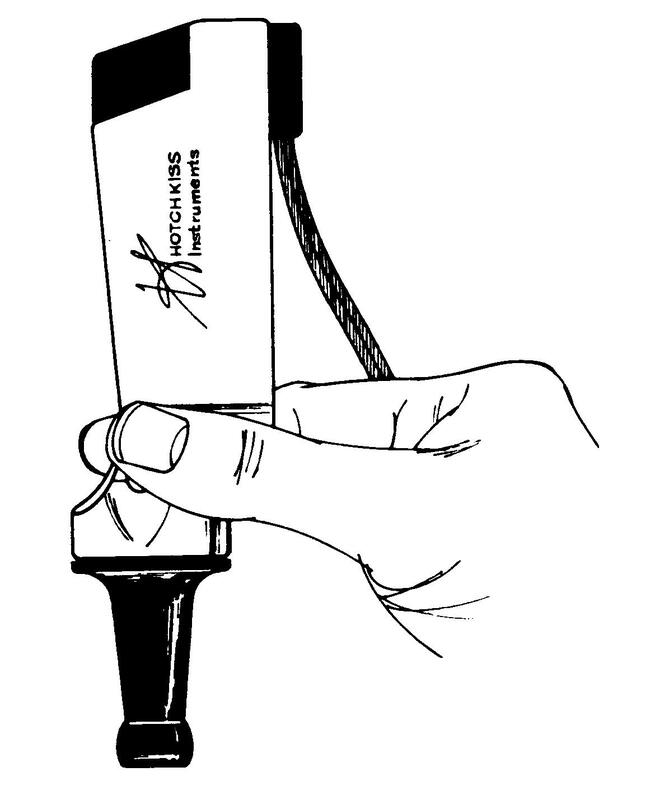 Do not sterilize or autoclave disposable specula. Designed to be thrown away after one use, disposable specula will not allow cross contamination. 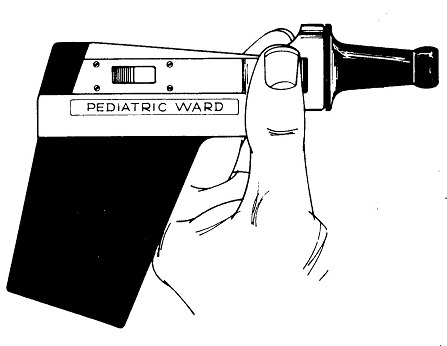 Have your name engraved onto your Hotchkiss Otoscope. We would be happy to personalize your Hotchkiss Otoscope. This helps ensure against your Otoscope ending up in someone else's hands. 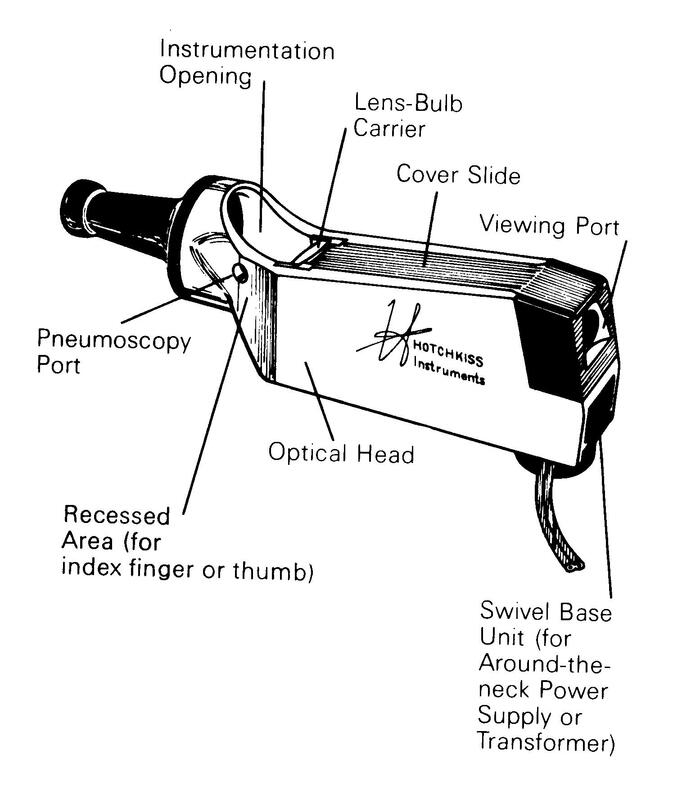 The Hotchkiss Otoscope is ideally suited for examining the nasal cavity. Choose the specula of appropriate size. Ask patient to breath through the mouth or to hold breath temporarily to avoid fogging up the lens. Note: As an additional measure to avoid fogging, a commercial antifogging agent may be used on the lens. The Hotchkiss Otoscope is ideally suited for examining the pharygeal area. The Xenon light beam is bright and direct, allowing for more accurate examination and better evaluation of color. Proudly made in the United States of America, the Hotchkiss Otoscope is unconditionally guaranteed for a period of one year against any defect in materials or workmanship.